the origin of the Mexican Martini. I’ve tried ordering it outside of Texas and get strange looks. I now know why: it’s a Texas creation, and more specifically, it looks like it is an Austin invention. 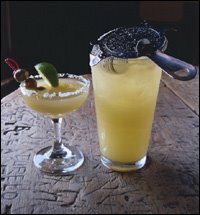 After doing a little online research, I found that both the Cedar Door and Trudy’s claim to be the home of the original Mexican Martini. Finish with freshly squeezed lime juice, a splash of orange juice, and sweet and sour. Shake well and serve in a champagne glass with a salted rim, garnished with three olives on a sword pick and a lime wedge. Trudy’s doesn’t list their recipe on their site, but I found one claiming to be their’s on Recipezaar. Shake well and serve in a martini glass garnished with a few olives and the martini glass can be rimmed in salt. So, it appears this uses sweet and sour mix in place of Cedar Door’s Martini Mix. I read elsewhere that Cedar Door’s mix is primarily pure cane sugar, water, and citrus oils. I’ve also seen a few recipes call for a few dashes of olive juice, but I think the olives in the bottom of the glass will be more than enough saltiness to cut through the sweetness of this drink. >Whoever invented it, I’ll have one!